Across the US, more homeowners are beginning to use a programmable thermostat to save time, money and increase efficiency in their home. As simple a change as installing a programmable thermostat can offer many benefits to your family home. 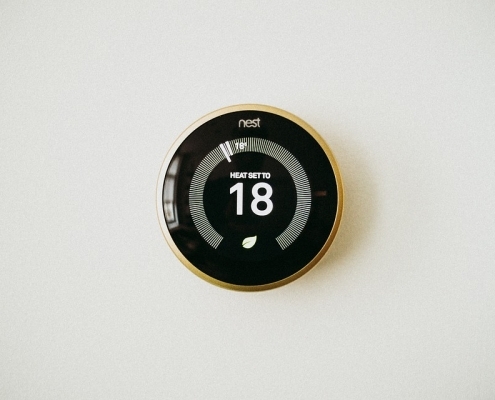 Adding a programmable thermostat to your HVAC system is something we can help you do, and we can help guide you to the right unit for your needs. Get in touch with our team to learn more about programmable thermostats, as well as internet-connected thermostats you can control from your phone or computer while away from home. Spend less time adjusting your thermostat with a programmable thermostat. A manual thermostat can take a lot of trial and error, and you’ll need to reset in constantly if you want to change temps overnight or while on vacation. With a programmable thermostat, you can eliminate those trips back to the wall and schedule your thermostat once per season. Set it and forget it. Because you aren’t forgetting to turn it down at night, while at work or on vacation, you’ll be saving money on your energy bills. Every degree up or down can save 2% on your energy bill, on average. Create a schedule which follows your family’s routine and keeps you comfortable, but eases your use of energy and cost. A more efficient home will use resources more wisely, and bring less wear and tear on your system. Using a programmable thermostat means your furnace or A/C unit doesn’t need to run as often when you’re not home, reducing their hours of use drastically and saving you on maintenance costs. Programmable thermostats make it easy to customize different temperatures in different zones, if you have zone control already. Using zones effectively can increase your energy efficiency, and make your home more comfortable overall.